Here are a few of my more recent favorites. As always, if you have any you'd like to recommend, let me know (thank you Jenna Baum for recommending One Head, Two Brains!!!). If you go to an antique store, you might find posters showing a human head with the brain divided like a map. Reason is in one quadrant, emotion in another. Memory is over here, imagination there. For a long time, the popular representations of hemispheric differences focused on what different parts of the brain do. Iain says what really distinguishes the hemispheres is not what they do but how they do the same things differently (via). “The brain is divided into two hemispheres” Psychiatrist Iain McGilchrist argues, “so that it can produce two different views of reality. One of the hemispheres, the right, focuses on the big picture. The left focuses on details. Both are essential. If you can't see the big picture, you don't understand what you're doing. If you can't home in on the details, you can't accomplish the simplest tasks. Iain uses a couple examples to explain, but the one most intriguing was that of a bird finding a worm. All living creatures need to be able to attend to the world in two different ways, which require quite different attention at the same time. And this is simply not possible unless they can work relatively independently. On the one hand, in order to manipulate the world - to get food, to pick up a twig to build a nest - you need a very precise, targeted attention on a detail in order to be able to achieve that and be ahead of your competition. But if you're only doing that - if you're a bird just concentrating on the little seed, you'll become somebody else's lunch while you're getting your own because you need, at the same time, to be paying the precise opposite kind of attention - not piecemeal, fragmented and entirely detailed but sustained, broad and vigilant for predators and for other members of your species. It truly is a fascinating discussion of our brain, but it’s also fairly dense and needs some attention. I had to listen to it twice, with the second time sitting at my desk while following the script. It was just too much to handle for a single, somewhat distracted, drive into town. A perfect sidekick to a left-brain, right-brain debate. With his book Thinking, Fast and Slow, Daniel Kahneman emerged as one of the most intriguing voices on the complexity of human thought and behavior. He is a psychologist who won the Nobel Prize in economics for helping to create the field of behavioral economics — and is a self-described “constant worrier” (via). the fact that arguments that feel irrefutable come to our mind so easily doesn’t mean that those arguments are the real cause of our beliefs and doesn’t mean much of anything about the validity of the argument. The way that the mind works, very frequently, is that we start from a decision, or we start from a belief, and then the stories that explain it come to our mind. And the sequence that we have when we think about thinking, that arguments come first and conclusions come later, that sequence is often reversed. Conclusions come first, and rationalizations come later. If something is going wrong in your workplace, there's probably a law that explains why. Like Goodhart's Law, which says if a company decides to measure something, workers will find a way to respond with good numbers. Or, the Peter Principle, which says that every employee tends to rise to their level of incompetence. Not sure if this is right or left brain, but the unconscious mind is pretty untrustworthy. At least, according to these made up yet accurate laws. I texted this to my fellow admin because I couldn’t help but think of education and test scores specific. Pretty good stuff! I sent this one to my wife. In war-torn Gaza, Ami Vitale was asked to “focus on the violence.” Then, one day, while her and all the other photo journalists were capturing kids throwing rocks and soldiers bullets, Ami heard music. She followed it. And found a wedding. From then on, Ami Vitale changed the way she tells stories. She still captures the hard and terrible ones because that is still very much a part of life, but she also seeks out the beautiful and hopeful, the ones that inspire and spark joy, because those too are a part of life. And Ami Vitale wants to provide a balance and reminder “of our connections”, that we are all human beings on this world, longing for the same things, eager to tell and share our stories. Another episode I enjoyed by Wild Ideas Worth Living was CHRIS MCDOUGALL – WRITING UNTOLD STORIES ABOUT RUNNING AND AMAZING HUMAN PERFORMANCE. I LOVED the book (Born to Run) and truly enjoyed hearing more of his story. Definitely worth a listen. How does bias distort our thinking, our listening, our beliefs... and even our search results? How can we fight it? This hour, TED speakers explore ideas about the unconscious biases that shape us. I actually haven’t quite finished this one yet, but it’s pretty golden - especially when considering the habits and attitudes of the right and left sides of our brain. Enjoy the day, and happy listening. Here are a few of my more recent favorites. As always, if you have any you'd like to recommend, let me know (thank you Sarah Downs for recommending War of the Worlds!!!). It's been 80 years to the day since Orson Welles' infamous radio drama "The War of the Worlds" echoed far and wide over the airwaves. So we want to bring you back to our very first live hour, where we take a deep dive into what was one of the most controversial moments in broadcasting history. "The War of the Worlds," a radio play about Martians invading New Jersey, caused panic when it originally aired, and it's continued to fool people since--from Santiago, Chile to Buffalo, New York to a particularly disastrous evening in Quito, Ecuador. My whole family thoroughly enjoyed this one. The summary doesn't do it justice so I deleted everything but the opening sentence. Libraries aren't just for books. Most of December was dedicated to this podcast series entitled, "MEN." It's a newer podcast, with only it's third season available, and as one might imagine, the first season isn't great. The third one, however, is very good. I appreciated just about every episode, but this one was exceptional. The struggles against sexism and racism come together in the bodies, and the lives, of black women. Co-hosts Celeste Headlee and John Biewen look at the intersections between male dominance and white supremacy in the United States, and the movements to overcome them, from the 1800s through the 2016 presidential election. Six Who Sat : Why six women had to sit, so that they could run. Before the 1970s, women were not welcome at the world's great marathons, but a few brave pioneers sought to challenge that system. Six Who Sat tells the story of two iconic moments in women's running, both captured in photographs. The first, from 1968, is of a race director trying to physically restrain a woman from running the Boston Marathon. 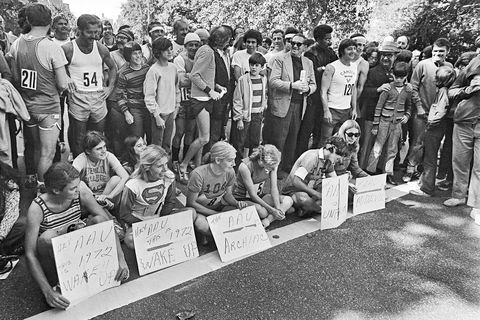 The second, from 1972, is of a protest at the New York City Marathon that forever changed women's ability to participate in the sport they loved. While listening to this podcast, Six Who Sat, by the 30 for 30 ESPN podcast, I couldn’t help but think about golfing. I hardly ever golf, but when I do I always notice the different tee boxes: Competition tees (white), men's tees (yellow), women's tees (red) and sometimes blue tees for veterans and juniors. Why hasn’t anyone “sat” for this obvious display of gender bias? Of course the woman’s tee is closer, they can’t hit nearly as far!!! Chanel just called, to say . . .
Heavyweight “is the show about journeying back to the moment when everything went wrong,” and then trying to pick up the pieces, make amends, or seek forgiveness. It’s a brilliant show. I’ve listed some of my favorite episodes here, or you can listen to all of them on Apple Podcasts and Spotify. Hello all! And a special welcome to those recently joined! For those new, once a month I try and send out some of my favorite podcasts because, as was mentioned in a reply to last month's email, "I've grown weary of 'Here! listen to this podcast' suggestions because episodically they are SOOO hit and miss." And I would agree. With that in mind, I hope this helps sift through some of the more, "Meh" episodes and provides you with at least a few quality, gonna-pass-this-along podcasts. Which is what makes this podcast, this discussion, so intriguing. This might be my favorite of the month. Two season are available, and once you start, don’t be shocked if you get sucked into them all. I did. Quickly and joyously. At just over 25 minutes, this short podcast will have you sincerely considering if banging the left side of your head against the nearest wall is worth it. Seriously. In 2006, Derek Amato suffered a major concussion from diving into a shallow swimming pool. When he woke up in the hospital, he was different. He discovered he was really good a playing piano. Yes, we're serious. Derek is one of just a few dozen known "sudden savants" or "accidental geniuses"—people who survive severe head injuries and come out the other side with special gifts for music or math or art (via). Sorry, you can’t listen to this one while running or driving, but no worries! Sitting and watching this man will not only entertain, it will inspire. If five isn't enough and you're looking for more, peruse over here to your heart's content! Thanks for reading and tagging along! I'll admit it, without shame, that this podcast was by far my favorite from this past week. It's fantastically convicting and encouraging, and it's also deeply human. What if the first question we asked on a date were, "How are you crazy? I'm crazy like this"? Philosopher and writer Alain de Botton's essay "Why You Will Marry the Wrong Person" was one of the most-read articles in The New York Times in recent years. As people and as a culture, he says, we would be much saner and happier if we reexamined our very view of love. Nowhere do we realistically teach ourselves and our children how love deepens and stumbles, survives and evolves over time, and how that process has much more to do with ourselves than with what is right or wrong about our partner. The real work of love is not in the falling, but in what comes after. Whether you're married, dating, single, or a combination of them all, check this podcast out. It's a keeper. "The human brain has become one of the main capitol resources in our economy", yet our understanding of attention and multitasking - of the impacts of text messages and emails - is extremely limited (Did you know it takes your brain, roughly, 20 minutes to switch from task to task? I didn't). After listening to this podcast, I have a lot of simple (yet profound) changes to make. And not just for productivity sake, but for life and happiness and for cultivating deep relationships (coincided with The True Hard Work of Love and Relationships, the practicality of this podcast increases significantly). Tally hours of "deep work"
Say a mantra out loud, something like, "Schedule shutdown complete." They don't like advertisements. But really, they don't need them, because they do enough of it themselves. What is one thing you always thought you wanted, but then, once you got it, you no longer wanted it? How do you gradually declutter your home? How do you explain greed in our society? You can stop listening after these, if you're stretched for time, it does get a bit too preachy. But there's still good stuff in there. I've never been a huge Lance or Tour de France fan, but I am a fan of this podcast mainly because it wrestles with the process of reconciliation, personally, relationally, and (for those unfortunate few) publicly. At the time I listened to this I was dealing with a difficult relationship, still am actually, but at that particular time it was a very broken relationship (no, I won't tell you who it is) and Lance's journey, his thought process and his full circle of understanding hit home. Here's an excerpt from my favorite section, where Lance is describing why he finally took ownership of what he did and stopped trying to convince everyone (and himself) why he was being seen and treated unfairly. Look, “betrayal” is a terrible word. It’s a word that nobody wants, a child to their parent or friend to another friend, a spouse to a spouse, a C.E.O. to — whatever. It’s a very heavy word. Complicit is 100x. For me, I had already started to get my mind and my heart around the fact that people had suffered this tremendous amount of betrayal, and then I was hit with complicit. And it just — it rocked me to the core. But it was, I tell you, it was the greatest — her name is Melissa — it was the greatest gift that anybody has given me the last six years. And the story he tells after this, the one where a guy is standing on a bar balcony yelling, "F*** you!" is just beautiful. Okay, I'll be honest. I listened to this podcast over a year ago, but I've thought about it a lot recently, and many times in-between. Not only is she a great storyteller, but her conclusion of happiness (for her it's marriage but really, it can be anything - job, community, kids, whatever) is spot-on. "The grass isn't greener on the other side, the grass is greener where you water it." Sheesh, that's good. And so, so right. I hope you enjoy! If you have any favorites, send em along! I'm sure I'll listen to them at one point or another. If you want more, check out these top five favorites or peruse over here to your heart's content. A friend recently said, "I find that most of my conversations or sentences start with, 'I was listening to a podcast the other day . . .'" and we all laughed with familiarity. Because it's just so true, not only for her, but for most of us, and for sure for me. So I thought, "Why not compile my favorites and send them off for others to enjoy!" So I will. And so I am. "We know that people sometimes don't perform up to their potential, precisely when they want to the most," but why? And how do we stop it? Whether in business, sports, school, and everyday conversations, how do we not fall when the stakes are at their greatest? Freakonomics dives in and tries to provide an answer. Perhaps my favorite episode of the season, which is saying a lot because I really really liked episodes 3 and 4 which talk about memory and truth and how we should interpret both. But then, the final episode, the one where I (literally) lol'd, cried ever so slightly, and thought about my entire life and uncertain future, because it's just that good. For a species that is supposed to be the top of the food chain, the most evolved or uniquely designed (however you choose to view us), we are fairly dumb, extremely violent, and truly destructive. We're even bad at designing things, which is why we model so much after nature and animals. So why not learn from them? " . . . in the cathedral of the wild, we get to see the most beautiful parts of ourselves reflected back at us. And it is not only through other people that we get to experience our humanity but through all the creatures that live on this planet." In Tim Manley's roughly eight minute story, A Super Hero Gets Sick, he tells of when, as a boy, he become deeply sick. He was terrified of needles and didn't quiet understand all that was happening, as most young kids don't. But what he does know keeps him calm: his mother is at his side because she is his faithful sidekick - as any good superhero must have. The second story is from Melanie Kostrzewa. Told from a parents perspective, Melanie shares of the time her young daughter must undergo a craniotomy, the frustration of not being able to do anything, and the unexpected kindness of a doctor who did more than just save her daughter's life, he saved her hair. It's funny, enlightening, and worth every one of the 14 minutes. I even wrote about it on my 35 birthday. But you could probably just watch it later. At the very least, I hope you find these entertaining. At best, inspiring. I know I have been. Malcolm Gladwell's fantastic podcast is back for season 3! The first episode, Divide and Conquer: The Complete, Unabridged History of the World's Most Dangerous Semicolon. You can also listen to a special live taping of Malcolm and WorkLife’s Adam Grant (who wrote one of my favorite books of 2017) discussing "how to avoid doing highly undesirable tasks, what makes an idea interesting, and why Malcolm thinks we shouldn't root for the underdog." It's a great listen. I laughed aloud, thought a ton, and got supper geeked about this coming season. Also, if you haven't signed up for the monthly news letter, please scroll on down and do so! Anyone signing up this month will get a handwritten "Thank You!" card. Heretics : What if there is no hell? For the past week or so Reverend Carlton Pearson has been on my mind. I first heard his story on the podcast Heretics by This American Life, and ever since, several people have reached out asking if I'd listened to it and what I think of it. Clearly, it has his a nerve. 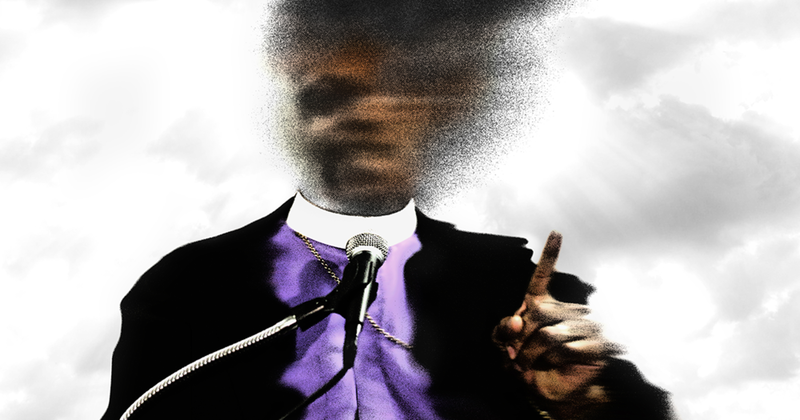 In the 1990's, Reverend Carlton Pearson was a rising star in the evangelical movement, but in the early 2000's, after he cast aside the idea of hell, "everything he'd worked for over his entire life" suddenly crumbled (via). Except his faith. Which is why he became a heretic. There's also a movie, produced by James D. Stern under his Endgame Entertainment banner, along with Ira Glass and This American Life banner, distributed by Netflix. "One of the moments I’m happiest with in our new film," Ira Glass writes, "is the scene where Jason Segel’s character Henry basically breaks up with his friend. Because his friend has come to believe some things Jason does not" (via). It’s moments like that which made me want to make this film. Years ago, I became aware that there was a huge gap between the way evangelicals are portrayed on TV and in films and in the news, and the evangelicals I know in my personal life. Who are not like the smiling, intolerant hardasses I see in the media, but complicated, sensitive, funny people who take seriously Jesus’s admonition to love one another (via). And I was reminded of Originals and the idea of "horizontal hostility." I would venture to say that the existence of hell is no "minor difference," but, shouldn't it be? At least in terms of the greater commission, to love one another? If there was no hell, if everyone was heading to heaven because God's love was indeed big and great enough, should that change anything? They we live and speak and think? Shouldn't we be rejoicing that people everywhere get to experience eternity with a loving God? And if the idea of hell is why we serve and minister and "love our neighbors," aren't we missing the whole point of the gospel? But also, and perhaps to the deepest point, why is someone not aloud to question and struggle? To look at what we've been doing for hundreds of years and say, "I don't know. We may be wrong - because we're human." Why are those who question considered heretics and kicked out of the church? When did being curious and wondering outside of tradition become the unpardonable sin? What I find most interesting with all this is, in the end, Reverend Carlton Pearson is ministering and loving the outcasts, the "sinners" and those whom Jesus would have been drawn to. Not the righteous pharisees. Which, in the end, is why I tend to side with Reverend Carlton Pearson. Not because I'm convinced he's right, but because I'm convinced in his process, in questioning and wrestling and the willingness to be wrong. Even if it means losing everything.